A Handbook For the Modern Man by Michael Flocker. The old-fashioned, repressed, un-moisturized man has been banished to the hinterlands and a new breed is taking center stage. He is a man of style, sophistication, and security, just as strong and confident as his predecessor, but far more diverse in his interests, his tastes, and, most importantly, his self-image. He may be seen at an NBA game one night and an art gallery opening the next. Able to navigate any social setting, he is informed, influential, intriguing, and very much in vogue these days. He is the new male ideal: the metrosexual man.So how can the average Joe keep up with this new version of cool? How should he behave, what shoes should he wear, and what CDs should he have in his collection? 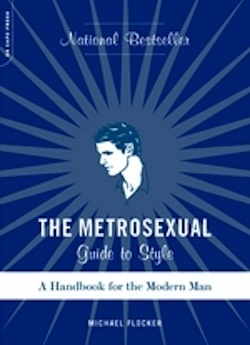 Answers to these questions and so many other pressing concerns can be found in The Metrosexual Guide to Style. Filled with entertaining anecdotes, famous quotes, helpful hints, dos and don'ts, recommendations and potential pitfalls, this handy guidebook covers everything from dining out to fashion and personal style, home decor to the Metro-mindset. It is the one-stop shop for the impeccably groomed and savvy modern man.